The vendor market for Voice of the Customer (VoC) products and services has been heating up, with numerous acquisitions and mergers. All of this is happening as companies are trying to figure out how to run successful VoC programs. It appears that we on the verge of the next stage in evolution for VoC. So I decided to step back and look at the overall market. Our research shows that nearly three-quarters of large companies rate their voice of the customer (VoC) programs as being successful (only 8% say that they’ve been unsuccessful). That’s great—infusing almost any type of customer insights into a business can add value. However, companies aren’t close to reaching their full potential. Only 14% of companies have reached the the two highest levels of Temkin Group’s VoC Maturity Model. One of the reasons for this immaturity is a simple fact: creating and managing great VoC programs isn’t easy. They take significant leadership commitment and a variety of expertise. In many cases, however, companies don’t redesign their approach to customer insights, they simply end up updating and automating many of their historical practices. 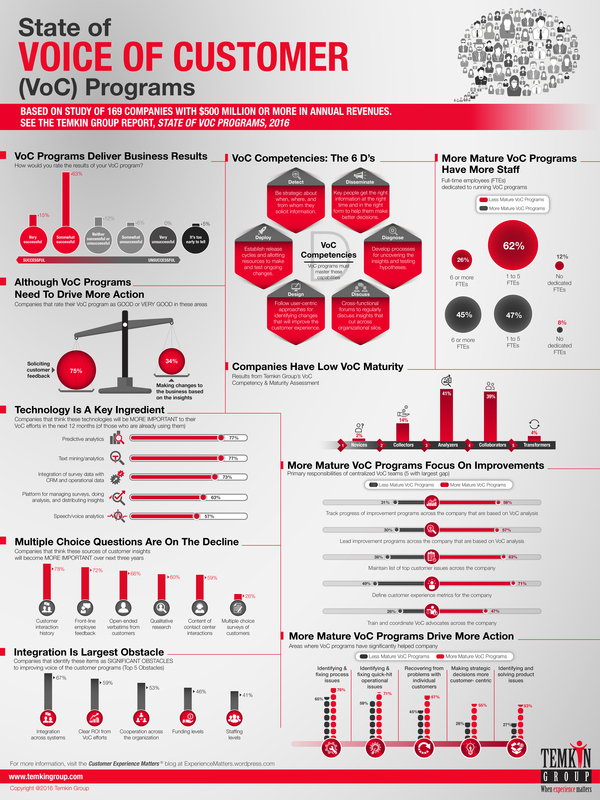 The big change for VoC programs is that they must focus more on enabling action across their organization. We found that only 24% of large firms think they are good at making changes to the business based on the insights. For VoC programs to fully mature, they need to become hyper-focused on generating insights in the right form at the right time to help people across their organizations make better, more informed decisions. As if that’s not enough to work on, companies will need to address Six Customer Insight Trends that will reshape VoC programs: 1) Deep Empathy, Not Stacks of Metrics; 2) Continuous Insights, Not Periodic Studies; 3) Customer Journeys, Not Isolated Interactions; 4) Useful Prescriptions, Not Past Descriptions; 5) Enterprise Intelligence, Not Customer Feedback; and 6) Mobile First, Not Mobile Responsive. To some degree, surveying functionality is becoming a commodity. Organizations are recognizing that feedback is not valuable on its own; it only becomes valuable when it’s used as an input to insights which drive some type of action. So the focus is no longer on feedback, but on insight and action. Hence, Customer Insight and Action (CIA) Platforms. Advanced analytics. We’ll see a considerable increase in the use of predictive analytics and the use of speech analytics to unlock insights from invaluable contact center conversations. …and way smarter analytics. The current set of analytics are mostly designed for analysts to uncover insights, but we’ll see more “packaged” analytics that mask complexity to provide tailored recommendations that improve high-impact decisions across the enterprise. More focus on casual users.The days of generic metrics and dashboards will hopefully be a thing of the past. The information provided to people will be specific to their roles, and will proactively highlight the information that they need to know. It may take the form of highly customized dashboards, but it could also be a monthly infographic that can be posted in the lunchroom for hourly workers. Less surveys, but more data. We already see in our research that organizations are becoming less reliant on surveys. This feedback will become less about understanding what’s being said by individual customers, and more about using the insights in predictive models to extrapolate what it might mean across entire segments of customers. This will require companies to integrate feedback with lots of customer data from other systems. More selective, targeted feedback. Companies will get better at strategic sampling. What is this? Being smarter about who they get feedback from and when they get that feedback. The current approach of trying to hear from as many customers a possible in as many places as possible is conceptually attractive, but it’s an inefficient use of internal resources, and it puts a strain on an even more important commodity—customers’ time and attention. The bottom line: VoC programs and vendors need a makeover. We just published a Temkin Group report, Lessons in CX Excellence, 2018. The report provides insights from six winners in the Temkin Group’s 2017 CX Excellence Awards. The report, which has more than 70 pages of content, includes an appendix with the finalists’ nomination forms. This report has rich insights about both B2B and B2C customer experience. Highlights specific examples of how these companies’ customer experience (CX) efforts have created value for both their customers and for their businesses. Describes winners’ best practices across the four customer experience competencies: purposeful leadership, compelling brand values, employee engagement, and customer connectedness. Includes all of the winners’ detailed nomination forms to help you collect examples and ideas to apply to your own CX efforts. We published a Temkin Group report, Net Promoter Score Benchmark Study, 2017. This is the sixth year of this study that includes Net Promoter® Scores (NPS®) on 299 companies across 20 industries based on a study of 10,000 U.S. consumers. With an NPS of 66, USAA’s insurance business earned the highest score in the study for the fifth year in a row. Comcast received the lowest NPS for the third year in a row with a score of -9. The industry average for NPS ranged from a high of 43 for auto dealers down to a low of 9 for TV & Internet service providers. Citibank, whose NPS lagged 35 points behind the banking average, fell the farthest behind its peers. All industries saw their average NPS decline over the past year, though Utilities dropped the most. 18- to 24-year-old consumers give companies the lowest NPS (with an average score of 17 across industries), while consumers 65 and older give the highest NPS (with an average score of 38 across industries). NPS is highly correlated with customer experience. On average, customer experience leaders enjoy an NPS over 18 points higher than customer experience laggards. See the NPS Benchmark Studies from 2012, 2013, 2014, 2015, and 2016. Across the 58 tech vendors we examined, NPS ranged from +43 to -22. Microsoft, SAS, Google, and VMware earned the highest NPS, while Accenture consulting, ACS, Autodesk, and Fujitsu received the lowest. Overall, the average NPS for the tech vendor industry decreased by more than eight points from last year, down from 29.9 to 21.4 – the lowest level of any year we’ve studied. Our analysis shows that NPS is correlated to customers’ willingness to spend more with tech vendors, try their new products and services, forgive them after a bad experience, and act as a reference for them with prospective clients. When it comes to loyalty, IT decision-makers are most likely to purchase more from Microsoft and HP, try new offerings from Microsoft and Google, forgive SAS and Microsoft if they make a mistake, and act as a reference for Apple and IBM SPSS. The report includes graphics with data for NPS, likelihood to repurchase, Temkin Forgiveness Ratings, and Temkin Innovation Equity Quotient (likely to try new offerings).. The excel spreadsheet includes this data (in more detail) for the 58 companies as well as summary data for other tech vendors with less than 40 pieces of feedback. It also includes the summary NPS scores from 2016. Purchase includes Excel spreadsheet with data. Download sample spreadsheet to see details. As you can see in the chart below, the NPS ranges from a high of 43 for Microsoft servers down to a low of -22 for Fujitsu. The industry average NPS decreased from 29.9 last year to 21.4 this year this year. Report details: The report includes graphics with data for NPS, likelihood to repurchase, Temkin Forgiveness Ratings, and Temkin Innovation Equity Quotient (likely to try new offerings). The excel spreadsheet includes this data (in more detail) for the 58 companies as well as summary data for other tech vendors with less than 40 pieces of feedback. It also includes the summary NPS scores from 2016. Note: See our 2016 NPS benchmark, 2015 NPS benchmark, 2014 NPS benchmark, 2013 NPS benchmark and 2012 NPS benchmark for tech vendors as well as our page full of NPS resources.